The QUT hosted the Open Access and Research Conference 2013 between 31 October – 1 November 2013. The conference was preceded by several half-day Pre-conference workshops on the 30 October. 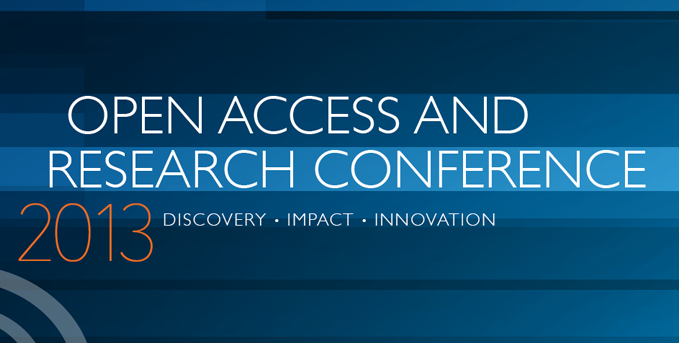 Overall, the conference worked on the theme of Discovery, Impact and Innovation and aimed to provide an opportunity to reflect on the progress of Open Access and to consider the strategic advantages these developments bring to the research sector more generally. A broad spectrum of policy and research management issues were covered including advocacy, open innovation and alternative metrics. There was a huge amount covered in the two days, and as always the opportunity to meet colleagues face to face after in some cases years of online collaboration was a highlight. The conference was filmed and the video recordings are linked on this page from presentations from Day One and Day Two below. The full program can be downloaded here. The current publishing model is not sustainable. The public remain depressingly confused about open access. It is extremely important to ensure the definition of open access is consistent and includes detail about reuse of material. Having good open access requires: good policy development, infrastructure to support the open access system and advocacy of the policy. 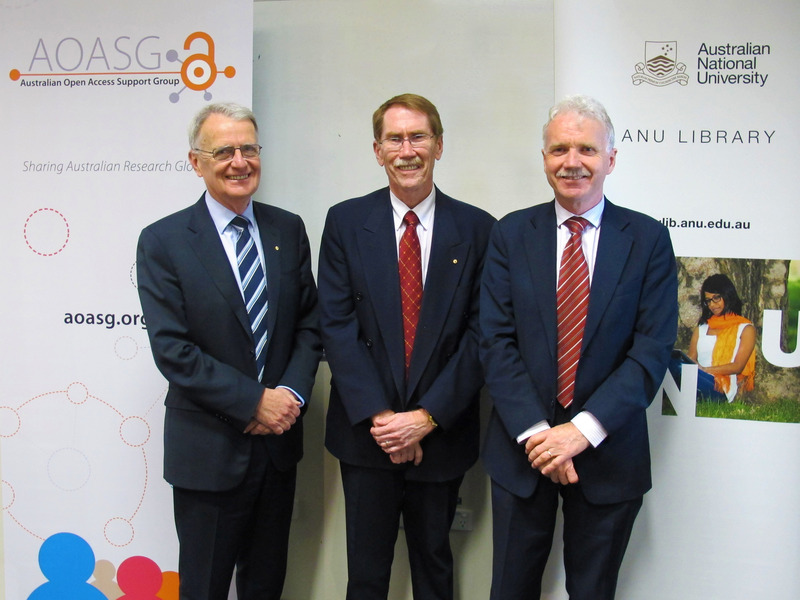 Australia is building real momentum in the open access area. Chinese publishers are increasingly ambitious in the international market. India is a net importer of knowledge – so open access helps India. A good policy requires deposit immediately on acceptance for publication. It is good to reach out to communities in their own language. The open and networked web can be exploited to solve complex scientific problems. Altmetrics are a researcher’s footprint in the community. Having a mandate alone is not enough. The patent system is supposed to lubricate the system but is increasingly throwing sand into the gears. Open stuff is useless unless you can translate it to something that means something. We are no longer moving physical things, we are now moving information through the knowledge space. Because patents are jurisdictional there are many other countries that can use the patented information. The new facility The Lens is a map of the patent world allowing innovators worldwide to access all of the knowledge held in the patent system. “Solving the Problem of Problem Solving”: How Open Access will Shift the Demographics of Innovation to Create a More Fair Society and More Resilient Global Economy. If monographs are behind paywalls when journals are free there is a problem for monographs. We need to be thinking of knowledge as a network and an infrastructure – a common intellectual conversation and a quest for knowledge. To celebrate Open Access Week 2013, the Australian Open Access Support Group is recognising two ‘Open Access Champions’ – an individual and an organisation. The Open Access Champion 2013 – Organisation Category has been awarded to the not-for-profit international development organisation Engineers Without Borders Institute’s Open Journal Project. Julian O’Shea, the Director of the EWB Institute, who is heading up the project, spoke to Danny Kingsley about what has happened in the three months since the AOASG featured a story about the project in July. In bestowing the Open Access Champion 2013 award the AOASG is recognising the excellent work that Engineers Without Borders (EWB) has been doing to open access to research. 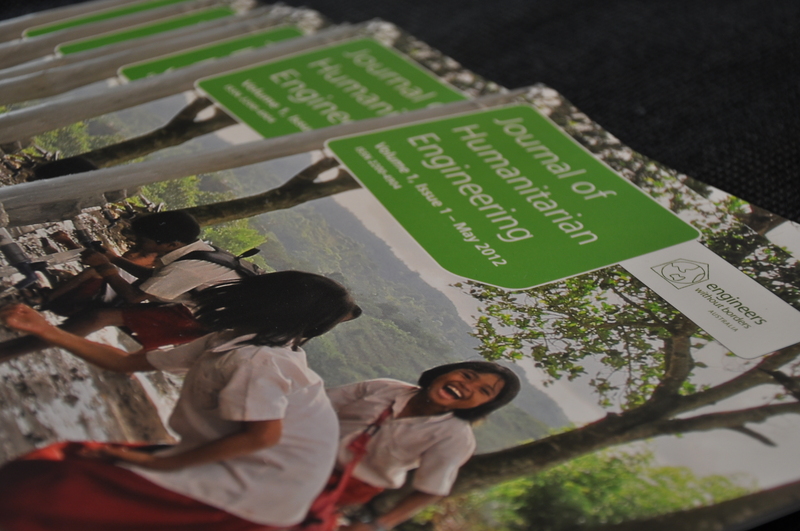 The Open Journal Project publishes the Journal of Humanitarian Engineering (JHE) which is not only open access, but provides easy to understand interpretations of the technical papers, translated into the local language(s) and addresses other issues of accessibility. This project exemplifies a true commitment to open access in its pure form. The Project has considered all aspects of accessibility, well beyond the first step of simply providing access to the original research. In addition, the stated intention of the Project to act as a stimulus for others to follow the example set further increases the already impressive impact of the Project. Since the project launched there has been a great deal of interest, explained Julian. “What is really pleasing is the level of academic interest,” he said. The EWB have been talking to practitioners in the area of WASH (Water Sanitation and Hygiene Wash) research. Despite the focus on development, much of this research is still published in closed journals. “This is probably one of the most important groups for development practice”, he explained. “But even people who would like to be out in the open publish in closed journals”. The group has been offering them the opportunity to publish in the JHE. And to increase interest, the EWB have started discussions with organisers of the international WASH conference being held next year in Australia. The JHE is intending to publish a WASH-themed issue at the same time. “The conference brings together leading academics and practitioners in WASH, so we will be using this as a platform to showcase our relatively young journal,” said Julian. “We want to build a network of the WASH and to formalise this as another opportunity to publish”. The project is also looking to engage researchers in many of the countries where the humanitarian work is being conducted. “We are looking at opportunities for them to publish”, said Julian. The Project has considered the issue of different academic standards in different countries. “If you apply a fixed standard to your journal you are ruling out many parts of the world that do not have that experience,” he said. “English is the primary language of our journal”. Many people who work in the area of humanitarian engineering may not have higher education degrees and may not have done formal academic writing. “If English is their second language we are happy to provide people in international research who can support and collaborate on the work”, said Julian. This is an open invitation, he explained, noting the journal is still a peer-reviewed journal committed to academic and technical rigour. “Their ideas have no less merit to their work but they do face academic hurdles”. The target audience for the journal’s articles are practitioners in the field in developing countries. “What we have found is the idea that something is on the web so therefore it can be accessed is a bit of a stretch”, explained Julian. The EWB have a program which is a design challenge for Australian students – to come up with research outcomes that can be more readily understood. The EWB are also planning to start spreading the word in person. “As of next year we will be disseminating these outcomes in country,” he said. “Because we have a network of people in country, with our local partners we will be holding local workshops targeting the groups we know about and share in person about what some of these outcomes have been”. The group hopes to run some workshops in Nepal, one on water and one on energy. This will be using a human connection. “We can’t underestimate that,” said Julian. “Sharing in person makes it a lot more real. We will be working on the networks within their communities that spread the word”. This AOASG award is not the only recognition the project has had. It was shortlisted for the World Youth Summit awards which recognises ICT and technology solutions addressing poverty alleviation. “We were the only program nominated from Australia”, explained Julian. The Project continues to innovate, with a summer project planned. “A student will develop a technology solution that converts an academic paper’s pdf or preprint into a low bandwidth version”, explained Julian. The EWB are hoping to be able to automate the conversion, to allow the process to be scaled up across whole journals. “We expect to have a prototype by early next year that will enable editors and publishers to have a version that is low bandwidth friendly,” he said. “So these can be accessed in the developing world where downloading a pdf can be a technical challenge – this will give practitioners more scope to download. The outcome of the project will be open source so it can be shared. A report released last week by the UK government has given open access advocates the world over something to cheer about. The recommendations of the report are particularly welcome to those who advocate for open access by deposit of work in an open access repository (which is the AOASG’s position). The UK House of Commons Business Innovations & Skills (BIS) Committee has been looking into open access and the report, Open Access: Fifth Report of Session 2013–14 from this investigation suggests that the position that the country has taken on open access should be readdressed. The current UK position is that research should be made available. While this is welcomed by the open access community, the method by which this is achieved is disputed. The UK supports the expensive and unsustainable method of paying for articles to be published open access. This position, reflected in the Research Councils of the UK (RCUK) open access policy , resulted from a report released last June by the Finch committee on open access to UK-funded research. There was considerable disquiet in the open access community at the time of the Finch Report. The AOASG wrote a story about some of the effects the Finch Report and the subsequent RCUK open access policy has had on research accessibility in Australia “UK’s open access policies have global consequences” – this was published 17 September in The Conversation UK. This blog will highlight some of the more interesting sections of the BIS Report with some commentary around it. There is also reference to some of the ensuing commentary that has emerged in the UK. The blog has the headings Report purpose, The system is broken, Problems with hybrid, Different embargo periods and Other notable blog commentary. Note this doesn’t mean the remainder of the BIS Report is of no interest. As an excellent summary of many aspects of the open access debate currently, it is worth a read in full if you have the time. This blog is the first of two looking at the BIS Report. The other – “BIS Report part two: Information & observations” – is available here. The BIS Report begins with the observation that it is necessary to transition to open access, but there needs to be a discussion about the best way to achieve it (par 2). However it notes that current policy raises the risk that “the Government’s current open access policy will inadvertently encourage and prolong the dysfunctional elements of the scholarly publishing market, which are a major barrier to access” (par 3). The BIS Report recommends that the Government and RCUK should reconsider the importance of repositories and green open access in the move to full open access (par 70). The BIS Report notes: “A recurring theme in this inquiry has been that elements of the scholarly publishing market are dysfunctional” (par 73). The primary issue is that of price. There are two problems – one is the separation of the value of services provided by publishers compared to what they charge. “The costs of publishing services are increasingly disassociated from the value of the actual services provided. We heard evidence that costs of peer review, formatting, editing and other publisher services are exaggerated by publishers, keeping prices artificially high” (par 74). The second issue has long been recognised. The library role in negotiating the price for subscriptions means that “authors are desensitised to the prices of journals in which they publish” (par 75) and this hampers the development of a functional market. The BIS Report discussed the issue of hybrid journals in some depth. Many submissions had said that the current policy had the unintended consequences of pushing up the cost of article processing charges and: “allowing ‘double dipping’ by hybrid publishers” (par 36). The report noted that Reed Elsevier had provided evidence that publishers were responding to the RCUK policy by increasing the amount of hybrid open-access publishing (par 37). The problem is that gold open access is very expensive compared to green. Work undertaken by Australian Professor John Houghton (with Dr Alma Swan) was cited, stating “adopting Gold would cost UK universities 12 times the cost of adopting Green, and for the more research intensive universities, Gold could cost 25 times as much as going Green” (par 61). A second concern was that the universities and research organisations are expected to find the funds for this (par 64). A recommendation arising from this was that “the Finch working group commissions an independent report on APC pricing, which should include average APC prices of pure Gold journals and hybrid journals, domestically and internationally” (par 58). This would be very welcome. The BIS Report noted “the absence of evidence that short embargo periods harm subscription publishers” (par 49). This relates to the observation that immediate green open access affects subscription rates, which is discussed in the sister blog to this one. What is interesting, however, was the observation that the Committee did not receive any evidence that Humanities, Arts and Social Sciences (HASS) disciplines needed longer embargoes than Science, Technical, Engineering and Medical (STEM) disciplines. In general this idea comes form the longer ‘shelf life’ of HASS articles. The result of this distinction is that the Finch Report recommended “embargoes for HASS subjects of 24 months and for STEM subjects of 12 months” (par 45). In light of any evidence to support the position, the BIS Report recommended a revision of the Government and RCUK policies to “place an upper limit of 6 month embargoes on STEM subject research and up to 12 month embargoes for HASS subject research” (par 50). The Russell Group of universities released a statement that argued pulling back the length of acceptable embargo periods means that researchers will have to pay for open access because publishers have longer embargoes (so the only way to comply is to pay for gold). They then go on to say that the amount of funding available for publication would only cover 10% of their output. COMMENT: This is a back to front argument. The concerns should be directed at publishers, demanding they reduce their embargoes, not at the BIS Report. It is the current status quo that supports this unsustainable situation. The BIS Report offers ways to turn that back. Not surprisingly the release of the BIS Report has resulted in considerable commentary in the UK. Below is a list of more prominent online discussions. Proponents of open access generally agree that there are many benefits to open access, but discussions about the processes involved in achieving open access often stop at making the published research available. But what happens when the issues of accessibility are considered? A remarkable project is underway in Australia, spearheaded by the Australian chapter of a not-for-profit international development organisation, Engineers Without Borders (EWB). The Open Journal Project aims to explore and promote techniques to make academic information genuinely open and accessible – with a focus on groups that are often excluded from access to this type of information. EWB is a volunteer organisation, sending volunteers overseas to a local non government organisation to work on the ground on a project. The Open Journal Project considers the needs of individuals and practitioners in other countries. “The Project doesn’t finish the day you press publish – that’s when it starts,” explained Julian O’Shea, who is the Director of the EWB Institute, the education, research and training section of EWB, and is heading up the Project. The EWB Institute is based in Melbourne, and is publishing a peer-reviewed journal as a pilot and case study in their work. The Journal of Humanitarian Engineering (JHE) is piloting innovations in open access, including multi-language access, developing country access, low-bandwidth websites, and disability-accessible content. The EWB has noticed that practitioners overseas are under-served by the current publishing process. As an example, Julian stated that the leading university in Cambodia does not have access to the largest database in the field of engineering. The idea for the focus of the journal began because the group saw there were very few that focused on experience, drawing on outcomes from developments and disseminating that information. The group wanted to encourage this as a field of research in academia. They were not sure what level of interest there would be in the journal because from a purely technical point of view they are not publishing innovative technologies. Rather, the focus is on new ways of applying this technology. “We have been surprised and pleased that the journal has been really positively responded to,” said Julian. The journal is published open access, with no cost to the author or to the reader. It uses an open source program called Open Journal Systems to run the administration of the peer review and publication. All papers in the journal are available under a CC-BY 3.0 license. Academic papers can be difficult to read even for people within a field. They can become impenetrable to researchers in parallel fields. This problem is further exacerbated in an international environment, working with practitioners on the ground who may not have any tertiary education. There are several issues with language. The first is the problem of making the technical reports understandable to the lay person. Often the papers in this area are very technical, including many equations, and can reach 300 pages. To solve this problem authors in the JHE are required to submit a two page plain summary about the paper with the formal paper. This means a project manager on the ground can make a decision about applying the technology or approach and then pass the full paper on to the technical manager. But many of these projects are in countries where English is not the primary language. The Project addresses this by making the reports available in the language of the country it is targeted towards. The Project translates the plain language guides into both the local language of most importance and into other general languages. The Project called on goodwill to obtain the translations. They sent articles out to the world, asking for volunteers to translate the papers. This had a good response from universities, companies or simply people to help out on the website. The Project now has an approved translator list. The first time an article is translated it is sent to a native speaker to approve it and once this is done the translator can go onto the list. The quality of translations has been very high, said Julian, with only one that had to be sent back. To date the plain language summaries have been translated into Indonesian, Italian, Portuguese, Russian, Hindi, Chinese, Spanish, Danish, Khmer and French. The number of languages is growing. Another consideration is bandwidth. In many countries the internet connection is through a mobile telephone which prevents the download of large documents. The Project decided to produce the journal on a low bandwidth, and this opened up new issues. “Generally the journal system distributes through pdfs,” explained Julian. “The problem is it is all or nothing – if the download cuts out at 90% you get nothing.” So the Project looked at releasing html versions of the papers. This has reduced the size of the website to 4.3KB and the journal articles are about 18KB. “We can put about 80 journals onto a floppy disk,” he said. The Project also has plans to further improve the distribution to remote areas. “We haven’t done it yet but we will have a system that says ‘here’s a postcard, send it to us and we will send the paper to you by donkey’”, said Julian. With a philosophy of sharing research, it was important to the project to provide versions of the papers in an accessible format for people with disabilities. The choice of publishing html versions of papers assists people with vision impairment, as they translate better using text-to-talk programs than pdfs. In addition, the project is being proactive about embedding helpful metadata within the document such as describing images. The Project has used the guidelines for Vision Australia to release a large print edition of the papers. “The first one took about couple of minutes – after that it was very simple,” said Julian. “That is what we are trying to show in this project, to meet a need for some people can be solved in literally two minutes.” The team has also produced Braille editions of the plain language guides. The Open Journal Project is hoping to formally launch later this year. Meanwhile, Volume 2 issue 1 is about to be released.